Experienced and always be ready to learn and try my best. Easy-going, Openminded, Flexible, Humorous, Intellectual, Sophisticated. 5.knows about fashion prducts such as bags, watches & jewelery,glasses, shoes, garment and cosmetic & beauty and care products well, knows about hotel products,mould,lighting and electronic prouducts and so on;have experience in investment conferences in Asia. 7.Familar with Chinese food and custom. How to choose a supplier in China? 1. How to choose a supplier in China? Firstly, decide what products to sell. There are many variables that should be considered before deciding on a product to sell. To get inspiration, you can just go to a standard shopping mall or building materials market, visit an industry ...Sourcing Suppliers in China by yourself or a local assistant? Amanda is a very nice person to work with. She works hard and she is flexible when plan changes. She was very pro-active during my visits to several companies. I liked discussing all kind of things like Chinese culture and language during traveling. She is friendly, intelligent and has a good sense of humor! Thank you very much. Amanda was very helpful. We appreciate the credit. It ended up working out great and Sissi and Amanda were fantastic. I will defiantly be using your service again. thank you. Amanda was great in coordination, communication, confidence, convincing, negotiating. It was a great pleasure. She is astute & an ace, communicator, great problem solver. Ask intelligent questions. I would certainly recommend her to anyone across the globe. Amanda has been an excellent host, making me feel very safe, confident & enthusiastic during my visit to ShenZhen. She has an excellent understanding of our business needs and has been very quick to understand new products. Every meeting and visit she has accompanied me on has been very productive---opening up many new business relations for us in China and helping us understand the area. On the last day we had a very enjoyable sightseeing trip and helped me discover real Chinese food & culture. We will certainly be asking for her expert help again. Just a quick email to let you know I am back from China now and had a very successful trip visiting suppliers thanks to your assistance. Amanda was extremely valuable and helpful I could not have done it without her. I hope you have seen the feedback I wrote on the form for her. Amanda was one of the nicest and most genuine individuals I have ever met. She made sure everything went as planned and was perfectly interpreted. She always looked out for my best interest. I would without a doubt recommend her highly as your local guide, interpreter or business assistant. Amanda has an excellent skill in assisting, she has a very high skill in organizing & negotiating. She works very hard so that the client will not feel hassled at all. Honest and sincere is another way to describe Amanda. She always on the client’s side, cares for our budget of the trip also. Amanda is recommended AA++. It was very nice & comfortable to work with Amanda in ShenZhen & few other cities. She knows her job her English is excellent. Thanks to Freeiva for making my stay comfortable in China. I will recommend Amanda to everybody I know in the business. Amanda was most professional in all that she did for us. She is a pleasure to spend time with. Her English is very fluent and she is very mature and goes beyond her duties to make us feel very comfortable in China with both our work duties and our desire to learn more about China. We both look forward to our next visit to China and really hope Amanda will be available to assist us once again. Amanda has been a pleasure to work with. She is efficient, very positive-can do attitude! She worked through supplier meetings and negotiations well & assisted me with all of my days requirements. I would highly recommend Amanda to others & will definitely admire to work with Amanda. Amanda is a complete joy to work with, and will receive our absolute highest recommendation! She is very knowledgeable, business savvy, friendly personality, and an excellent translator and communicator. My first trip to Asia…and I could not have achieved the success I did without the exceptional assistance of Amanda. Less to do with my experience and more to do with her delightful energy, persistent effort and sincere understanding of my goals. Not only will use Amanda for every future trip but I will ask her to be our feet on the ground in China while we are back in the U.S. Top Rate! Amanda was a pleasure to work with. I would highly recommend her to other professionals, and I look forward to seeing her again. Amanda is such wonderful girl, who undertake her client’s requirement & fulfill it at the best! Whenever I come back I require her as guide. God Bless You! Amanda has provided exceptional service. She has tried her utmost best to accommodate to our needs. Her understanding of the English language is beyond what we expected. As far as recommending Amanda, we would without hesitation. Personal opinion is that we would definitely use Amanda again. Professional, Punctual, Perfect English, Helpful. Amanda can speak very good English, hard working, professional and accommodating. Ms. Wan was very helpful in searching for the new suppliers and she got familiar with the items I am searching for in a short period. She made my trip to ShenZhen so simple. One more thing she is elegant, with a big smile. Very professional to work with. Quick understanding of necessary business and very plesant person to work with. Highly recommendable! Everything was perfect, met on right time, she was so helpful. It was a pleasure to have Amanda accompany me on my business trip to GuangDong. 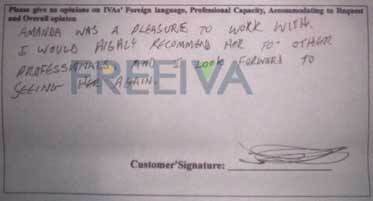 She was very professional & thorough, especially when helping to organize my itinerary & during my business meetings. Her great knowledge & understanding of many industries made me feel at ease throughout the 3 days of meetings. I appreciated Amanda's positive attitude & strong work ethic for what was a tight schedule. At the end of each day when we checked into our hotel, she was keen to be prepared for the next day & always asked me if she could do anything. Overall, I only have praise for Amanda & I liked her very much. I would request to use her again on my next trip to China. Very good experience. I would recommend her to others. Had a great time! Amanda is wonderful. Though she was not very experienced in the my field, but she tried her best to help me out, she did a great job for me. She is honest and Sincere, I wish her all the best for days to come. Good luck Amanda. She is also very friendly. Amanda was a terrific help to us! She spoke wonderful English and was very helpful with all our needs in ShenZhen. I recommend her to everyone! Amanda was a great help to us on our visit to Shenzhen, Also was excellent in her capacity of guide, translation and negotiation. I found Amanda very helpful. She worked very hard and was fantastic, her English was good and she made many good appointments for us. I will use her again. I highly recommend her. IVA( Amanda) will reply you later, you can login in your account to check IVA's reply ( View "Inquiry List" ). And you can discuss more details with IVAs.